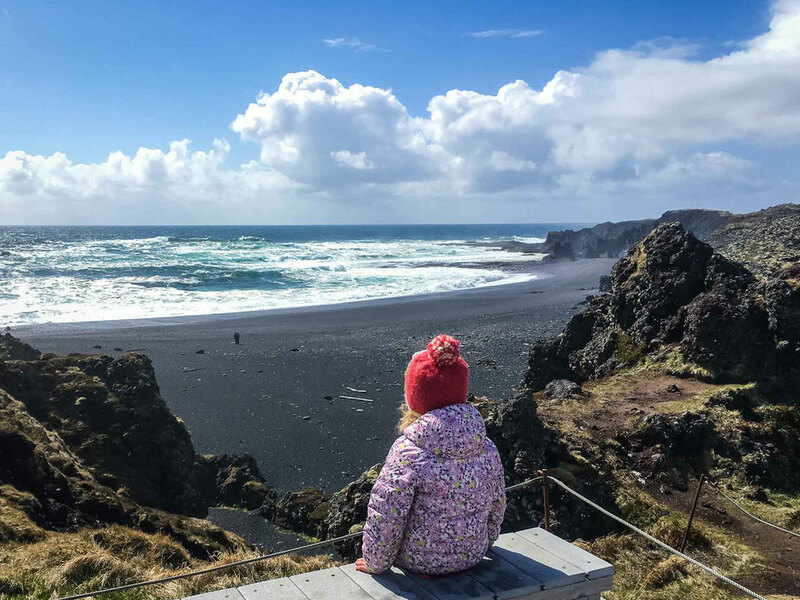 The family-friendly 1.6mile (2.5km) hike from Arnastapi to Hellnar is a must-do if you are visiting the Snæfellsnes Peninsula. 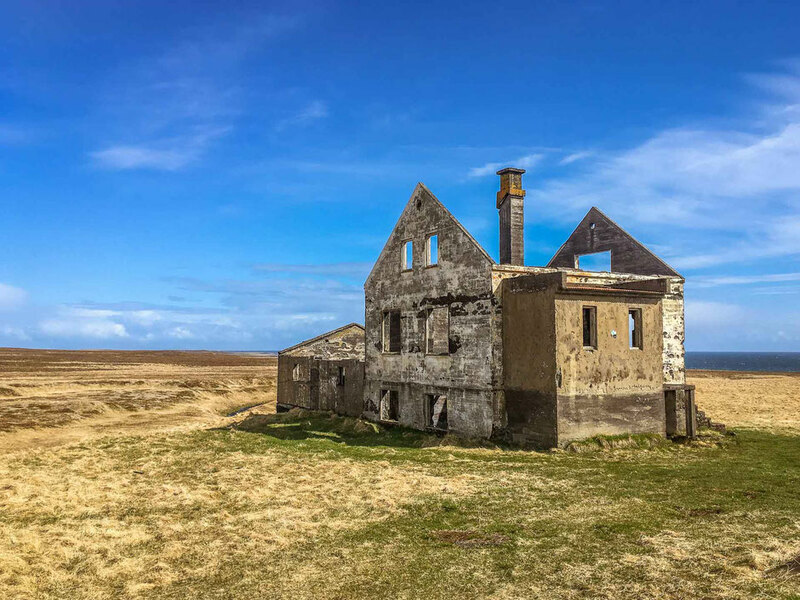 The trail provides a variety of breathtaking Icelandic scenery ranging from waves crashing on dramatic rocky cliffs, to walking through a field filled with volcanic rock and moss. 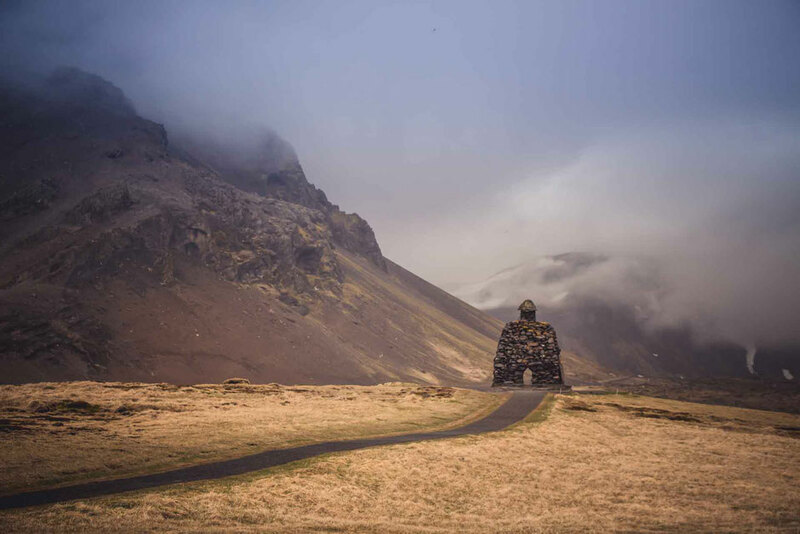 A half-troll statue and a natural stone arch wait for your discovery along this fun walking route. 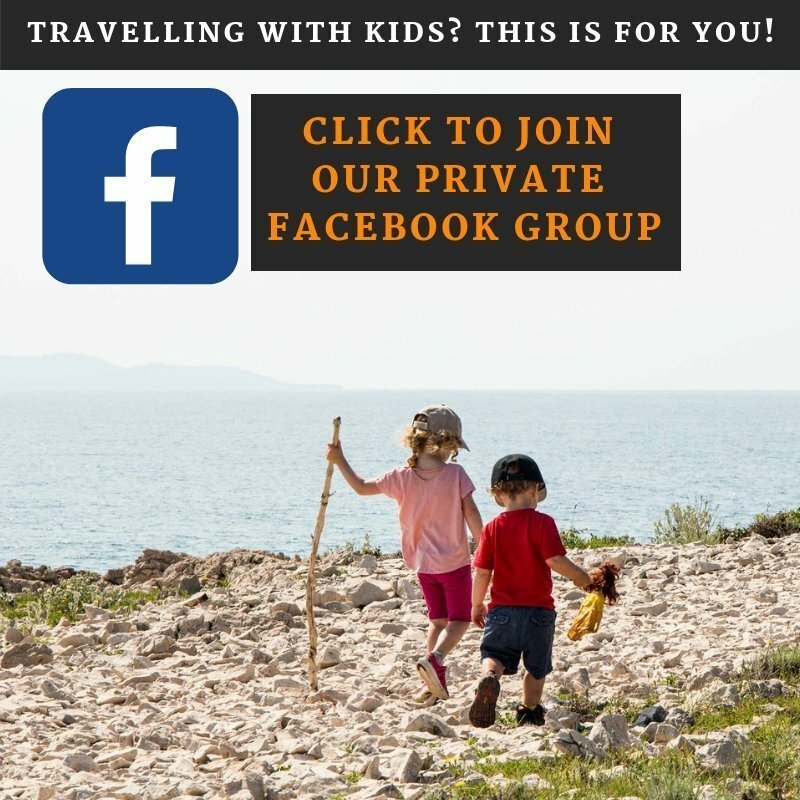 For more details on this hike, read this post! 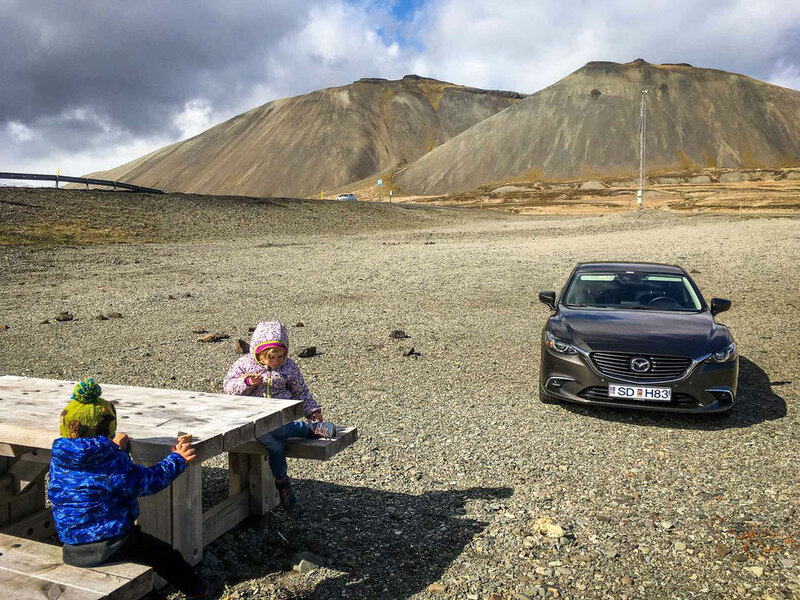 After lunch and naps, we set out to visit the many car-friendly sites in the Snaefellsjoekull National Park, which sits on the far west edge of the peninsula. 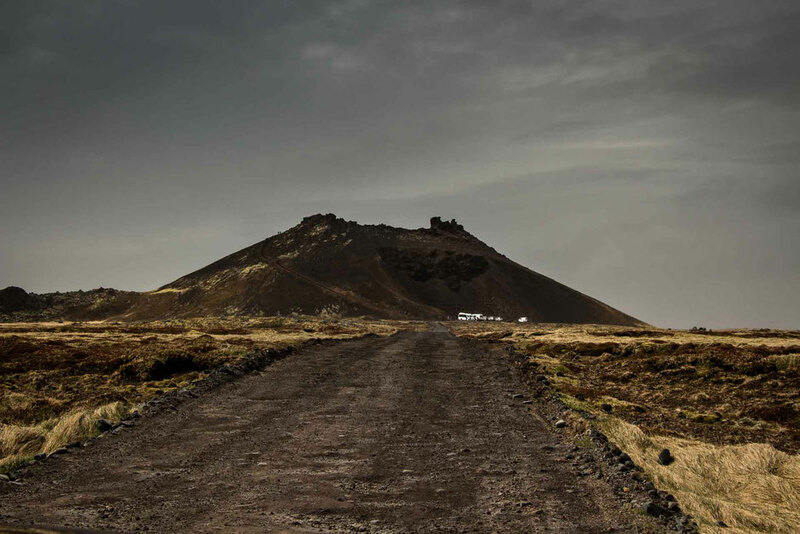 Our first stop was the Saxhóll Volcano Crater. 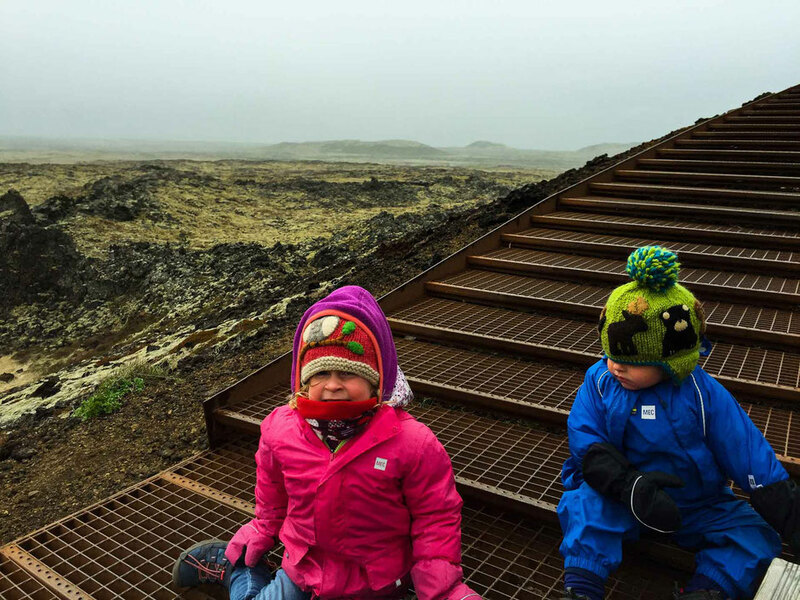 This popular volcanic crater is easily reached by climbing a set of metal stairs which lead from the parking lot and wind their way around the edge of the small volcano to the top. Upon arrival, we were shocked by the brute force of the wind when we opened the car door. The wind was so strong, it actually made the small drizzle of rain hurt when it hit your skin. We don’t typically let the weather get in our way, so we geared up in our many layers and set out to climb the stairs to the summit. The strong wind was at our backs and was making the uphill climb nice and easy. But it wasn’t long before we noticed the kids were having trouble standing, so we picked them up and kept climbing. A few people descending stopped to warn us that they could barely stand at the summit, but we kept on very carefully ascending. 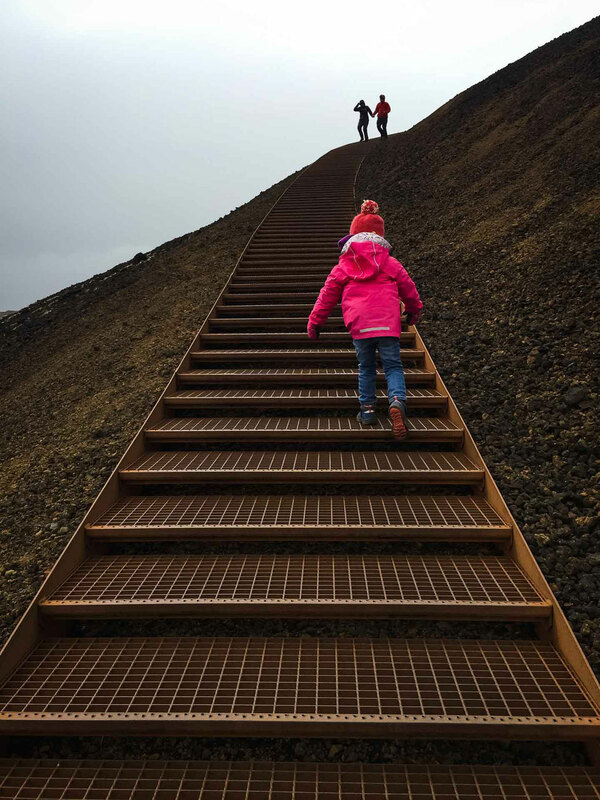 Soon enough, the strength of the wind made us reconsider our priorities – it just wasn’t safe enough to bring the kids to the top, so we walked back down to a bench about halfway up the volcano. 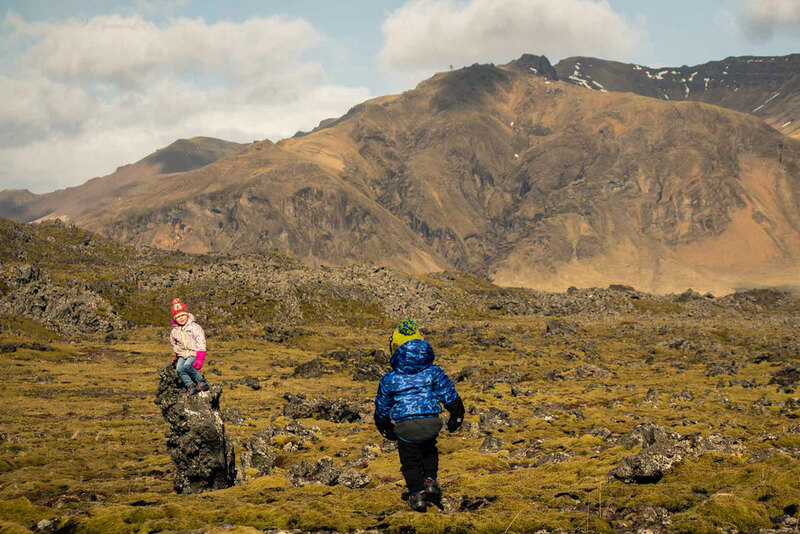 We took turns watching the kids, while the other went to the top for a quick look at the crater. The warnings were true – it was very hard to stand upright at the summit, but it was a pretty cool sight and was worth the effort. Too bad the kids missed out, they would have loved it. We pride ourselves on being all-weather outdoors people and we don’t let the weather beat us often, but it did today. It was simply cold, wet and nasty out, so we headed back to our cabin for the remainder of the day. 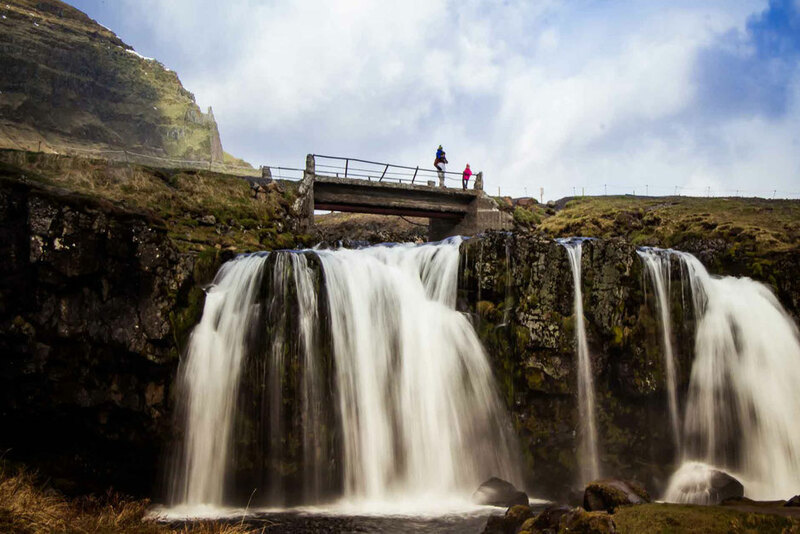 We hopped in the car and enjoyed a beautiful drive north on Highway 54 across a mountain pass to the Kirkjufellsfoss waterfall. 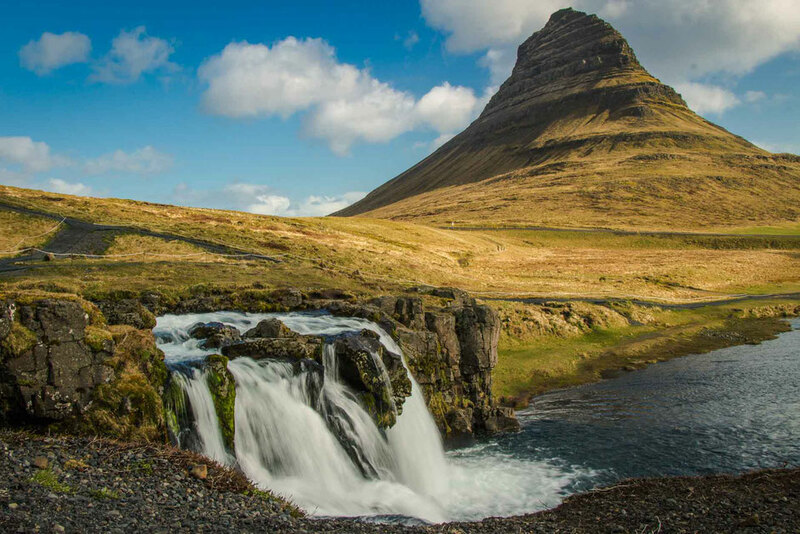 By itself this is an ok waterfall, but when you pair it with the majestic Kirkjufell Mountain in the background, it becomes a magical Icelandic experience. From the parking lot, you walk towards the waterfall on an easy level path alongside the river. Once you reach the lower falls the path starts to incline. The pictures here are nice, but don’t spend too much time here as they get much better in a bit. At the top of the waterfall, you cross over the river on a little bridge and then start descending on the other side. 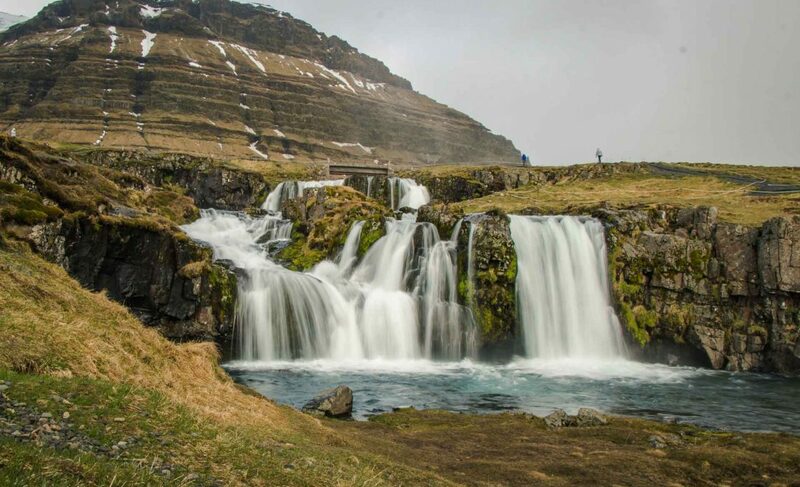 This is where you can start enjoying the views of the waterfall and the beautiful mountain together. There isn’t a lot of room where you can get pictures of both, so come here early to avoid battling the crowds. Unfortunately, the path doesn’t continue back to the parking lot from this side of the river, so you’ll need to backtrack up and over the river to get back to your car. Our kids were able to walk the hill no problem, but we needed to watch them closely as the little ‘safety’ ropes they use wouldn’t stop a toddler from going over. 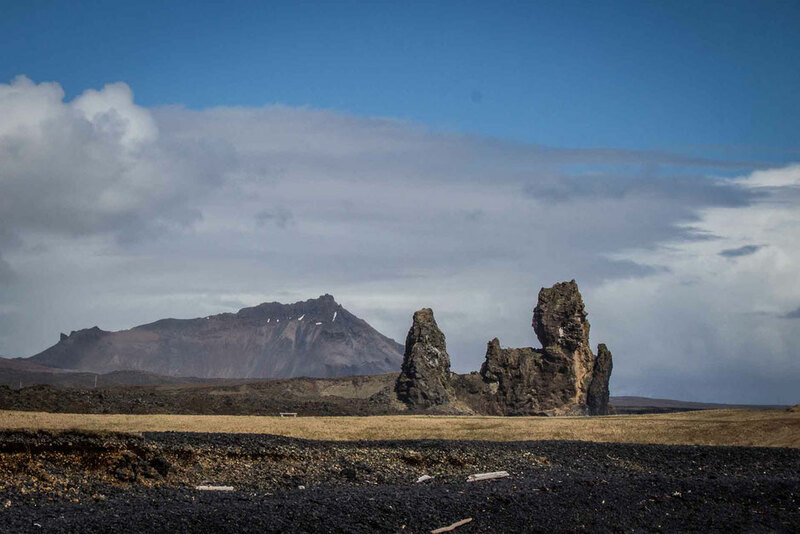 Continuing west along a beautiful coastal stretch of highway 54 we drove to the Berserkjahraun lava fields. You can immediately tell from the highway when you have entered the lava fields as there are large moss covered boulders everywhere. We entered the lava field just east of the Highway 56 turnoff and randomly parked on the side of the road at a point which looked fun. 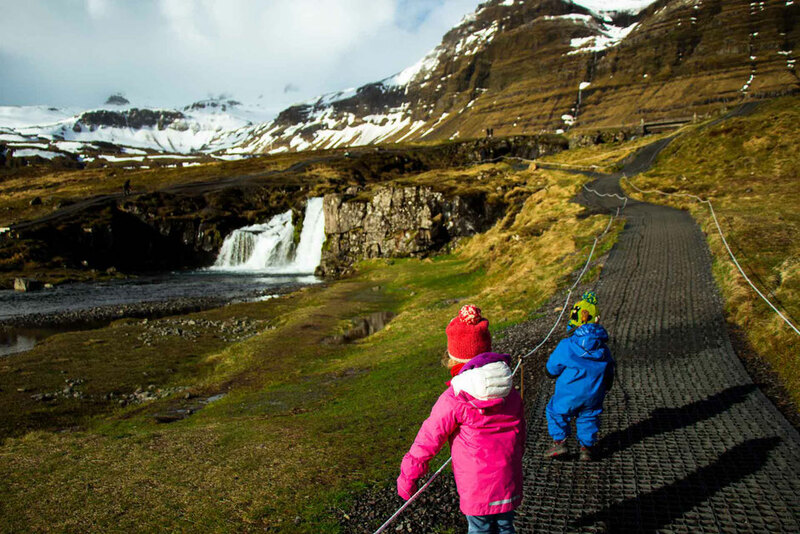 Our kids love exploring places like this. 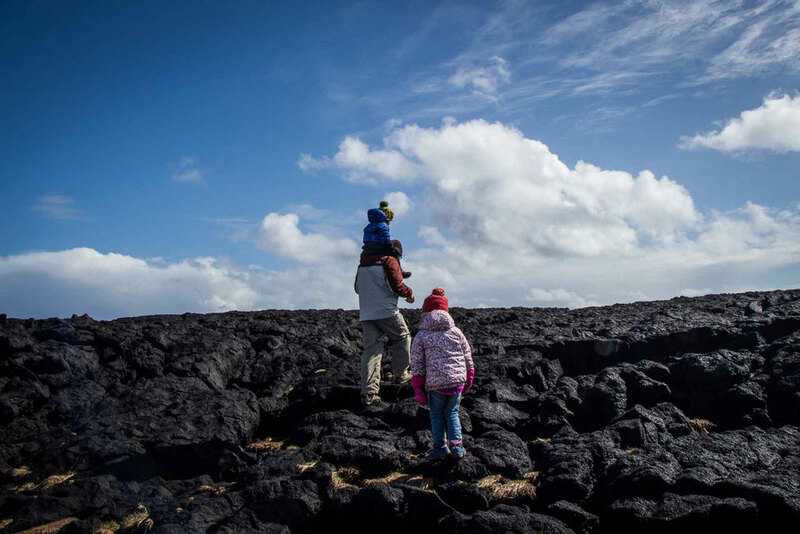 Large lava rocks are everywhere and the kids love climbing on them, running around them, hiding behind them, etc. 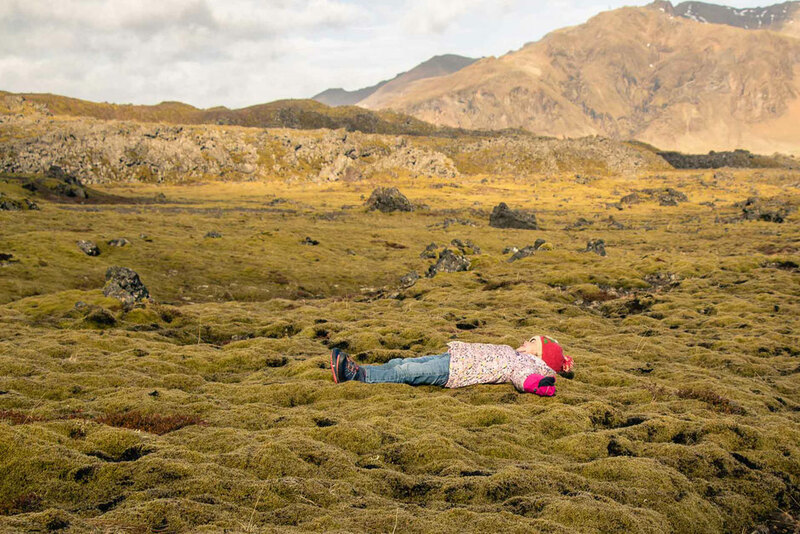 What makes this place extra fun is the spongy moss growing everywhere, which makes it feel like walking on a bed of marshmallows! We continued driving north to Stykkisholmur, the largest town on the peninsula as we had read several places that it’s the most charming town in all of Iceland. Not to be mean, but it didn’t live up to the advance billing. 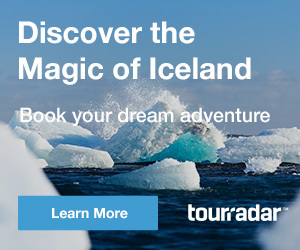 It’s a nice little town and all, but it’s not worth the extra trip up to see it, unless perhaps you are going on the Viking Sushi trip. 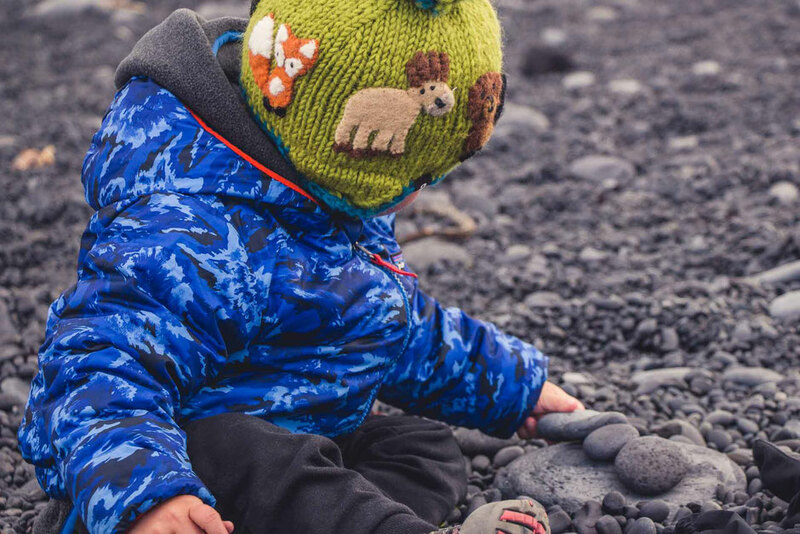 Driving back to our Airbnb for our little guy’s afternoon nap, we stopped for a quick packed lunch at a rest area alongside the Kolgrafarfjordur fjord, which is known for its marine life sightings (whales, dolphins etc). Although we didn’t see any marine life, the kids were pretty excited about the sheep skull and the duck skeleton they found in the parking lot. Our little guy got sneaky and slept on the way back, so we decided to make a few stops along the way in hopes of seeing some stuff without waking him up. 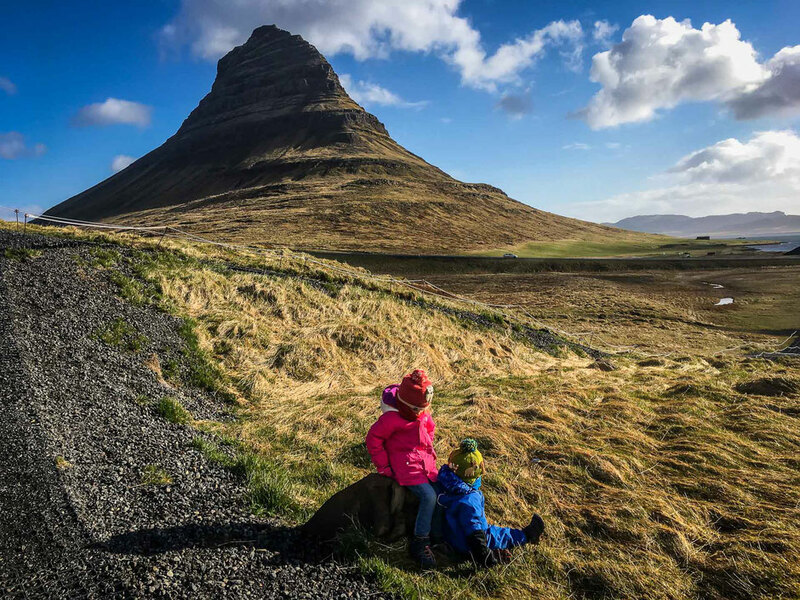 Our first stop was the statue of Bárður Snæfellsás, which we saw on our hike the previous day, but hadn’t actually gone up to see it. We took turns going with our daughter to see the statue while the other parent stayed in the car. The ‘statue’ is basically a huge rock pile shaped like a troll; it’s really fun and is worth stopping if you are in the area. Our son woke up while we were filling the car with gas, so we stopped in our nearby Airbnb for a quick snack, diaper change etc. 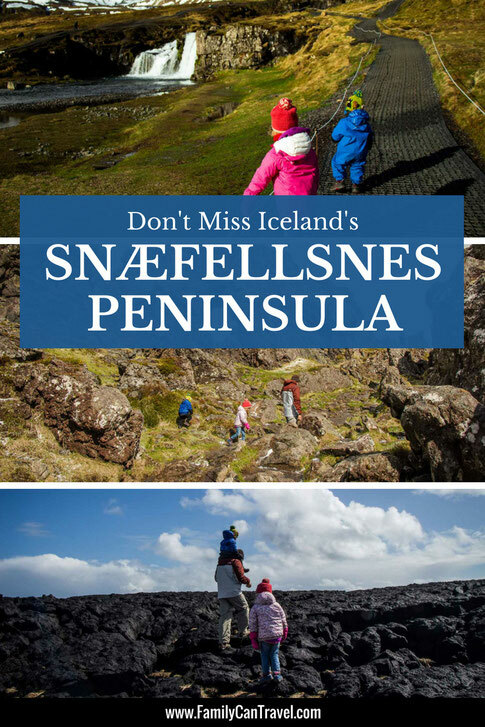 Soon we were off to the Snaefellsjoekull National Park to see the stuff we missed out on the day before. First up was the Djupalonssandur beach. From the car park, you have the choice of taking several paths. We took the one which said “To the beach”. The path descends via a rocky path through a little canyon of interesting rock formations, which our kids loved to climb on. 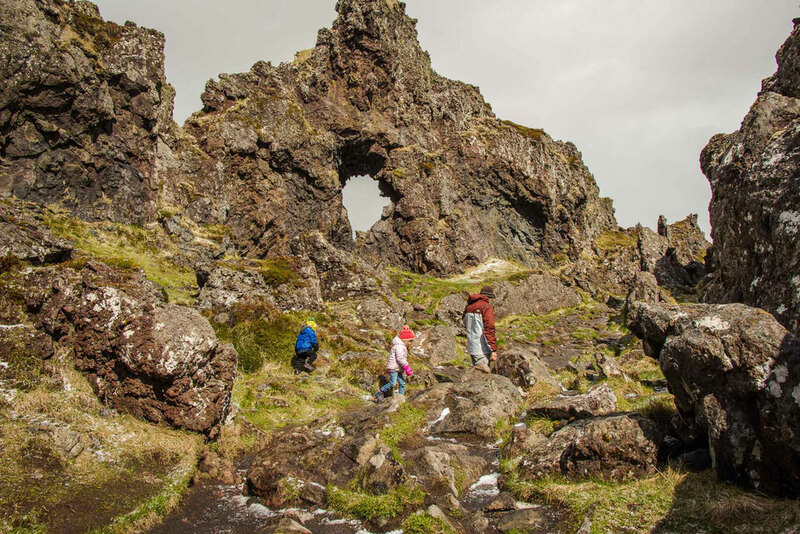 There is one spot where there is a hole in the rock face and you can poke your head through and see the other side – again, a big hit with the kids. Eventually, you arrive at a dramatic black sand beach. Besides the jet black rocks, the first thing you see is a set of ‘lifting rocks’ which sailors used to use to see who could lift the heaviest rock. As you walk along the beach towards the ocean, the next thing you notice is the rusted remains of a shipwreck, which crashed near here in the late 1940’s. But the best thing about this beach is the crashing waves. 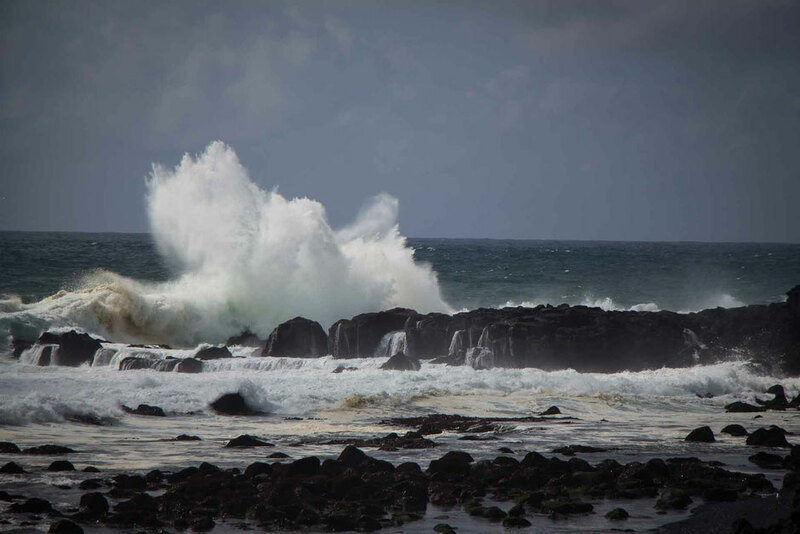 I imagine the waves differ each day, but on the day we visited they were massive and to see them crashing onto the beach with towering black rocks jutting out of the surf on both sides was simply incredible. 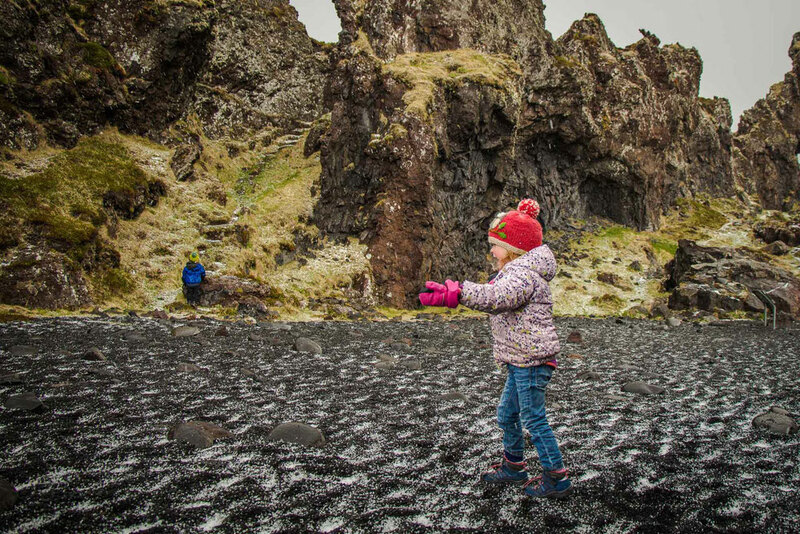 On the way back to our car we got caught in a sudden snow pellet storm which quickly turned the black beach white. We ducked for cover behind one of the rock formations and waited for it to pass, which it quickly did. At the parking lot, we walked along the boardwalk to a viewpoint high above the beach, sat at one of the benches and watched the mesmerizing waves a while longer before moving on. Next up was the Londrangar Cliffs near the Malariff lighthouse. 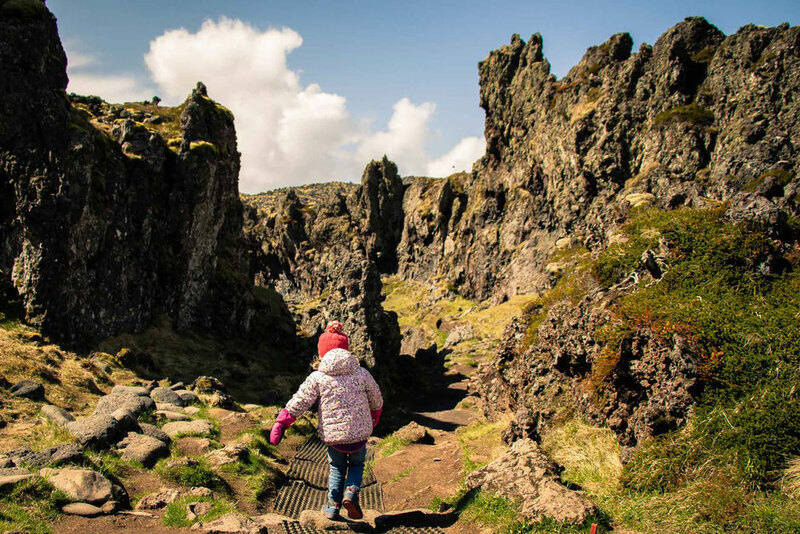 There are several reasons to visit this area: 1) the views of the Londrangar basalt rocks which are 75 and 61m tall and dominate the skyline for miles around. 2) The lighthouse and 3) the reason we came, is to see the rugged oceanside cliffs. 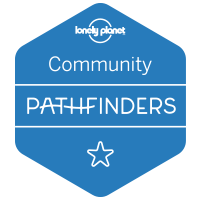 There are several trails which lead from the parking lot which head toward the coastline. As you near the water, the ground changes from soft grass to hard, black lava rock. This lava rock extends towards the ocean where it terminates at the edge of a tall cliff. 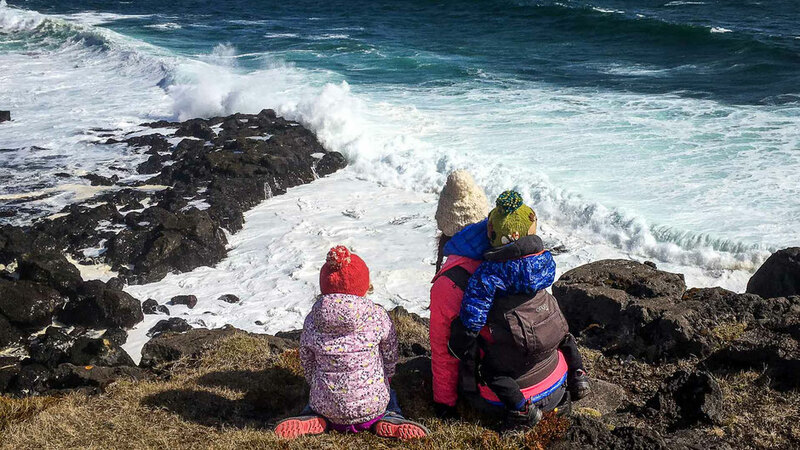 A similar experience to the Djupalonssandur beach, the views of the rough and powerful North Atlantic waves crashing ashore are awe inspiring. 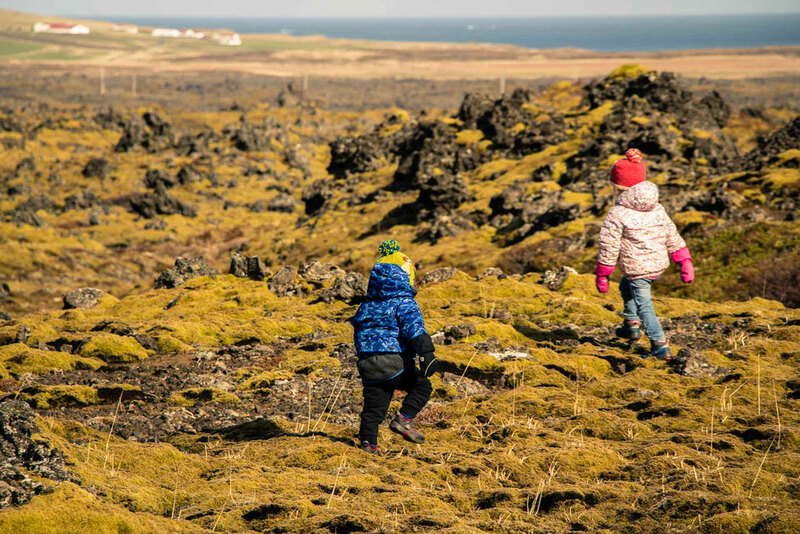 On our way back to Arnarstapi, we wanted to check out a short hike we saw on our favorite hiking app. It’s just east of the national park and follows a path to the ocean to a waterfall. We turned down the road with the ruins of an abandoned house in the distance. Parking at the house, we continued on foot to the edge of the oceanfront cliff. The waterfall was cute, but nothing that will appear on a postcard. What made the trip worthwhile were the views of the waves crashing without the crowds. It was just us four, sitting on the grass peacefully (well, as peaceful as it can get with a two year old) watching the waves. It was a special moment and a nice way to end our day. Despite the weather being ‘good’ for most of the day, we still encountered highly variable weather throughout the day. 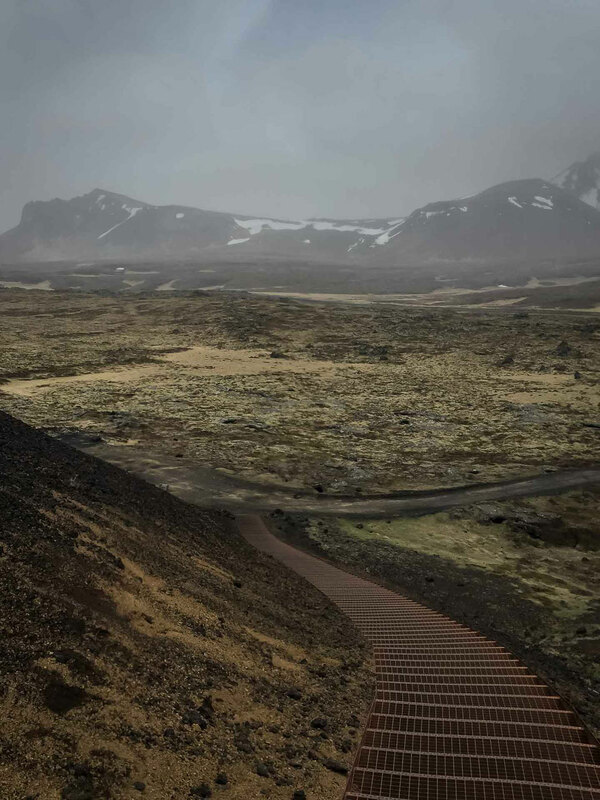 It was around 5C and windy most of the day, but every hour or so, a quick storm would blow through the area, with strong winds and snow pellets blowing horizontally, which actually stung when they hit our exposed skin. 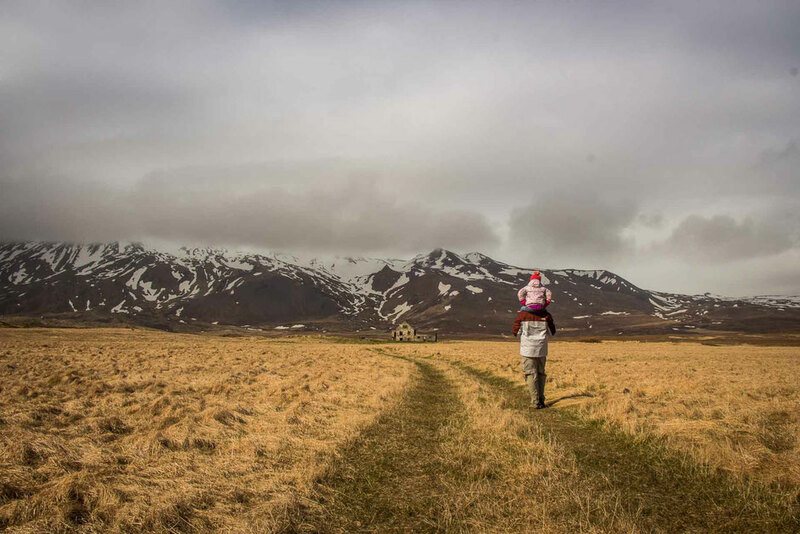 This is all part of visiting Iceland and we’re glad we got to experience it, but it reinforces the need to wear proper layers for your clothes while exploring as the weather never stays the same for long. 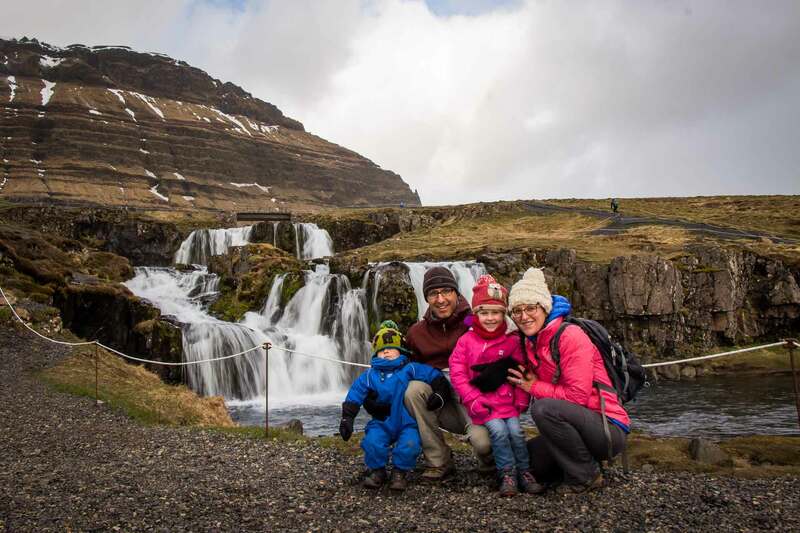 On our way to our two day stop in the Golden Circle we stopped for a quick visit to the Bjarnafoss waterfall. This waterfall features a long freefall at the top of the cliff then, as it reaches the bottom it begins a long cascade down the second half of the mountain. It is very striking. There is a path towards the waterfall leading from the big parking lot. The walk to the waterfall is pretty short at about 500m each way. There is a little elevation gain as you near the waterfall, but nothing too much. When the official trail ends, it looks like there is an unofficial trail which takes you even higher, but we didn’t go on it as it was raining pretty good. 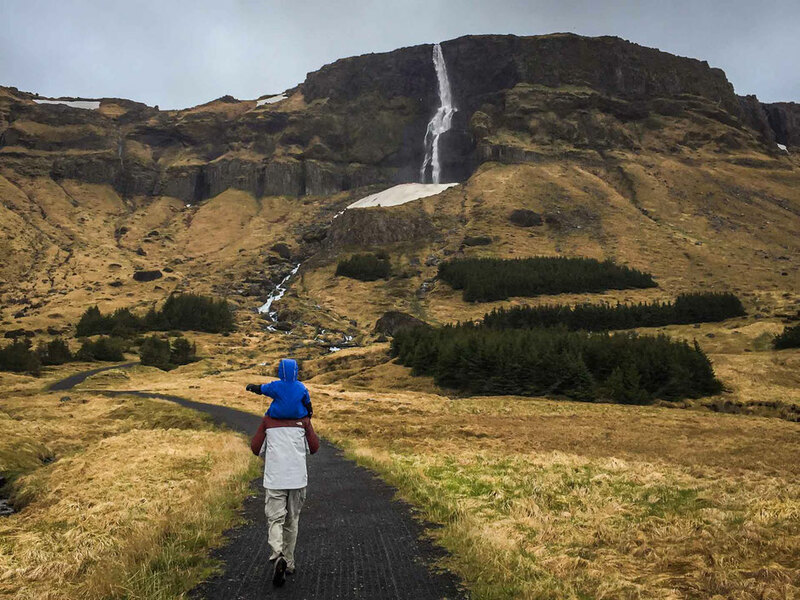 Our final stop on the Snæfellsnes peninsula was the Gerðuberg Cliffs, about 30 minutes east of the falls. 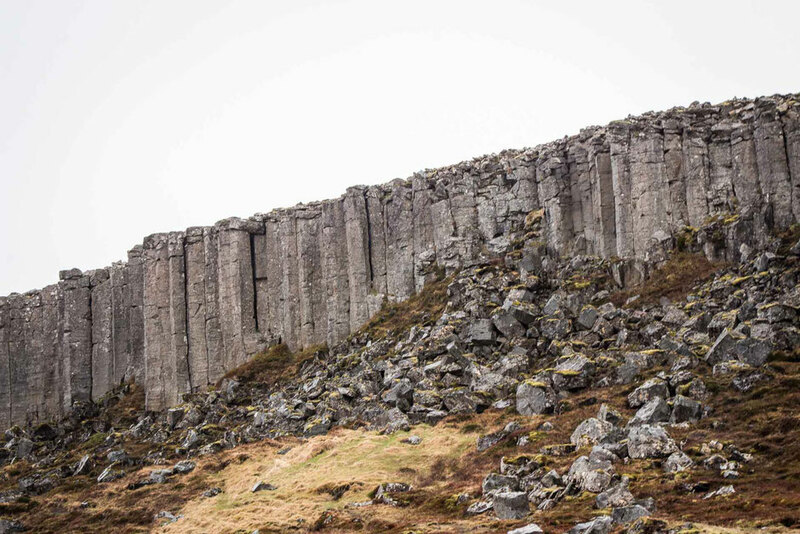 The Gerðuberg Cliffs are a long stretch of basalt columns which look like stone tubes stacked side-by-side for over a kilometer. They are quite interesting to look at, but to be honest the road runs parallel alongside the cliffs and it was raining really hard, so we drove up the road, then drove back the road, rolled down the window and took a few pictures, but never got out of the car. They were interesting, but not “get drenched in the rain” kind of interesting. On a nicer day, it would have been fun to get out of the car to get closer to the columns to appreciate their size and interesting shapes.